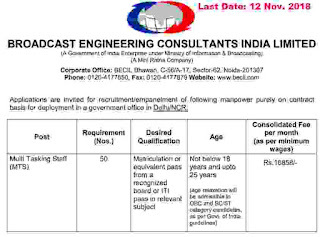 BECIL is stand for “ Broadcast Engineering Consultants India Limited”. This organization is looking to heir the fresher Indian candidates for Multi-tasking staff members. The complete detail related to this BECIL Vacancy is given inside the official Advertisement whose link we also shared under IMPORTANT LINK section. We try to explain each every prospective related to this BECIL recruitment process in this article. So you can also read it carefully for understand the criteria and other conditions related to this BECIL Recruitment 2018. BECIL department is inviting all Indian 10th pass candidates who have completed their ITI course of 2 years for these Government jobs in India. More information related to this BECIL Recruitment process is given below in this article. The employment will be done in the Delhi city in the various offices. Read the whole article carefully before applying online for these Government jobs in India 2018. Emoluments/Pay Band: Rs.16,858 per Month + other profit. Educational Criteria: Applicants who have passed in their 10th class examination after that completed their 2 years course in ITI in the relevant trade can apply for this BECIL Recruitment process 2018. Age Criteria: All applicants who are wishing to apply these Government jobs must have age in between 18 years to 25 years. What is the Application Fee for PO posts? 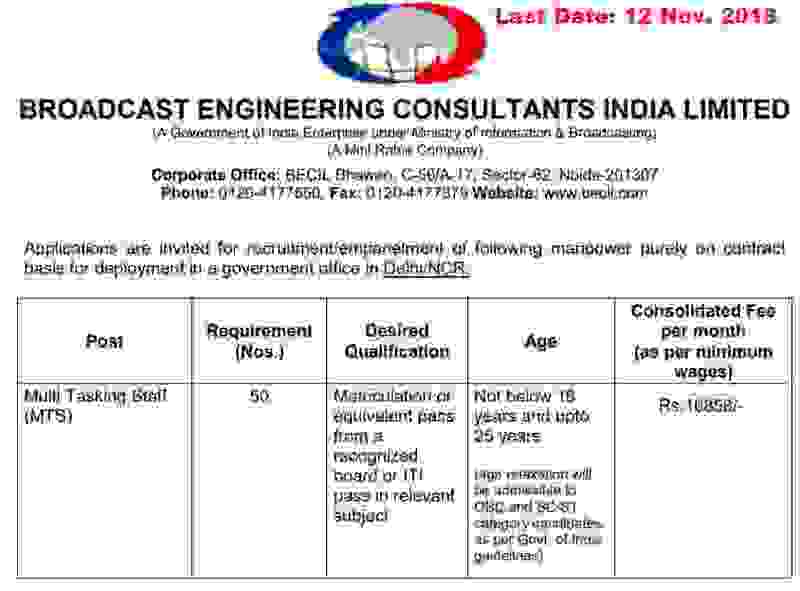 Paying Method: Pay Exam Fee through cash or demand draft drawn in favour of Broadcast Engineering Consultants India Limited payable at New Delhi. Candidates who are wishing to apply for these latest Government jobs for Multi-tasking staff have to apply offline. There is no other procedure for applying these Government jobs. We share the Advertisement Link as well as the application form link under IMPORTANT LINK section. Download the application form after that take the print out of that application form and filled up with your detail. Disclaimer: We took this information from the PDF file which was shared by the following website: “ http://www.becil.com”. On the basis of that file we share this information with our readers. So all right of the above information goes to this website.